Remember when going out to a bar or restaurant with your friends meant actually interacting with them? Since everyone has their heads buried in their iPhones and other mobile gadgets now, face-to-face interaction with other human beings has significantly declined. 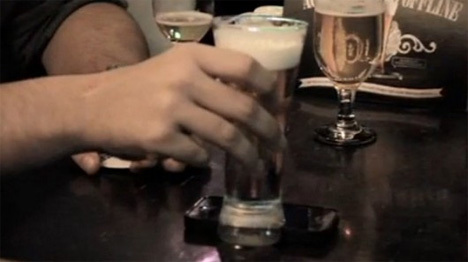 The Offline Glass is here to make sure you can either drink with your friends or fiddle with your iPhone – but not both. Designed by Mauricio Perussi, Melissa Pottker and Fischer & Friends, the Offline Glass is basically a beer glass with half a bottom. If you try to set it down normally, it will tip over and spill all of that precious, precious beer. But if you put your iPhone under the missing part of the bottom, it will sit upright and let you both enjoy your libations and interact with the actual humans right in front of you. There will always be some people who try to get around solutions like this, like by wedging something else into that void space so they can still use their phones. But the design is still a clever one that sends a message to those technophiles who can never seem to put their gadgets down long enough to enjoy the real world around them. 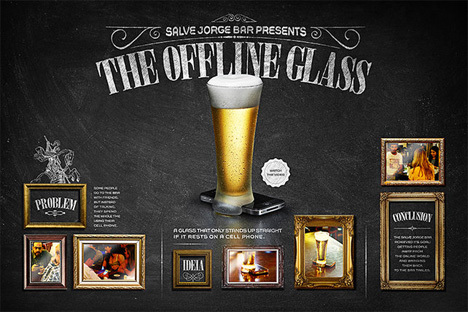 The Offline Glass has been field tested in a bar in Sao Paulo, Brazil, and it’s currently in production to reach a wider audience.